atopic children to topical oat and rice colloidal grain suspensions with and without previous exposure to colloidal grain suspensions.11 The double-blind, randomized patch study used two concentrations of oat and rice colloidal grains (0.007% and 0.7%) and applied them occlusively to the backs of 65 children living in Italy, whose ages ranged from 6 months to 2 years. Forty-three of the children had AD and 22 were normal. The Italian investigators found that there was neither immediate urticarial nor allergic reactions in any of the 65 study subjects. Radioallergosorbent (RAST) tests were performed on 55 subjects. The negative RAST test results found in the nonatopic group correlated with their nonatopic status, but positive RAST tests were found in only 8 of 35 (23%) of the children with AD, and none of the sera from positive RAST scores corresponded to subjects with irritant patch reactions. So the data indicates that topical colloidal grains can be used as an adjunctive therapy in the management of mild AD in children under 2 years of age. 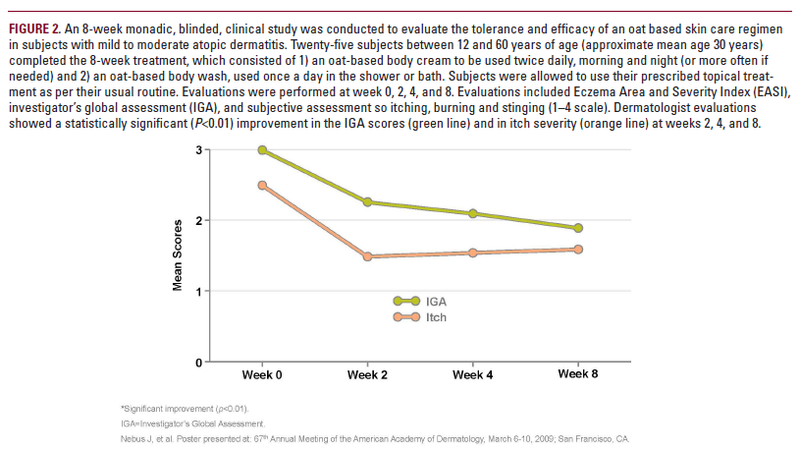 Grimalt and colleagues evaluated the effect of an emollient containing oat extracts on the quantity of topical corticosteroids used in infants with moderate to severe AD.12 Over the course of 6 weeks, 173 infants under 12 months of age were treated for inflammatory lesions by moderate- and/or high-potency topical corticosteroids. The infants were randomly assigned to receive the emollient, and the infants who did not receive the emollient acted as a control group.The quantity of moderate- and high-potency corticosteroids used during the 6-week trial decreased by 7.5% (not significant) for the control group and 42% (P< 0.05) for the infants receiving the emollient. The investigators found that oat emollient significantly reduced the infants’ corticosteroid use. Although the vast preponderance of studies have concluded that oat-containing moisturizers and/or cleansers are safe and effective for the treatment of AD, one French prospective study found that some children with AD were susceptible to oat-induced allergic reactions. Boussault and colleagues conducted a prospective analysis of 302 children with AD referred for allergy testing between June 2001 and December 2004.13 Atopy patch tests (ATP) and skin prick tests to oat proteins at concentrations of 1%, 3% and 5%, and the European standard series were performed on the children prior to oral food challenge and recurrent open application tests in the oat-sensitized group. In oat-sensitized children, the subjects respective oral food challenge and recurrent open application tests (ROAT) were positive in 15.6% of subjects (five of 32) and 28% (seven of 25) of subjects. Additionally, 32% of the children who used oat-derived topicals had oat-positive ATP tests compared to 0% in the children who did not use oat-derived topicals. The investigators concluded that oat sensitization in children with AD was higher than anticipated, and they suggested avoiding oat-containing proteins in children with AD.